Pharmaceutical industry remains one of the fastest growing sectors across the world triggered by an ageing world population and rise in the demand for life saving drugs globally. Reasoned to this fast paced growth, there exists immense opportunities for drug manufacturers, marketers of medicines and providers of pharmaceutical products, solutions and services which can be tapped with the right strategies. Blue Mail Media helps you flawlessly implement your multi-channel marketing strategy with a strong data repository. Our Pharmaceutical Industry Executives List can connect you with top decision makers, executives and professionals with whom you can explore new business opportunities. 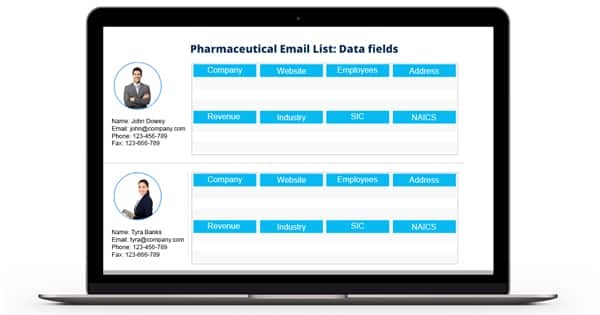 Blue Mail Media’s Pharmaceutical Industry Executives Email Database is designed to be highly reliable and result-oriented so that marketers are able to achieve a higher response rate, conversions and ROI. Our team of highly professional data specialists follow a stringent process for gathering data from authentic sources, organizing data based on industry needs, and enhancing the same on a constant basis by verifying details like email, phone number and more. Our strong data partner network across Africa, ASIA, Australia, Europe, North America, New Zealand, Middle East and South America positions Blue Mail Media to help clients with a global yet local approach. We have carved a niche in helping global organizations with competent data that never fails to deliver. Blue Mail Media offers enough flexibility to marketers as they can choose from our pre-packaged List of Pharmaceutical Industry Executives or get a customized list based on their campaign specific objectives.